Helen had a fantastic idea for a new series of posts. We all know how busy life gets and although we all have the best intentions of helping with home work or practising targets, it can be really hard to find the time, get everything ready, for your child to be in the right mood and then to do the work. So we have decided to write a series of posts dedicated to helping you save time and get work done! We will give you an activity with hopefully no preparation (or very little), write down exactly what to do and what to say, so you can actually go away and work on the skill. For our first post we are going to target vocabulary. Now this is something that every child can work on – whatever their level. It’s only going to help. It is also one that comes up frequently and I know I often set targets revolving around vocabulary knowledge. When we talk about vocabulary, it’s not just about knowing the name of something. To really understand and remember a word, we need to know much more. You don’t just know that that animal is called a cat – you also know that it’s furry (except those hairless ones! ), it purrs, it’s a pet, they come in different colours, they have four legs, it starts with a c and ends in a t – you will also have an opinion on whether you like them or not. All of this information feeds into our vocabulary knowledge. So we aren’t just going to teach the word, we also need to teach all this other information as well. Any place with some objects in – this could be a room at home/school or if you are feeling adventurous the garden, park or playground! We are going to describe objects in the room for your child to guess/ go and find. This is a great activity as you can easily make it easier or harder with no preparation – just change your questions. If your child finds this level tricky, read this post about understanding instructions. To make this a little harder, you can start to describe the item rather than ask for it by name. So rather than asking for the ball you could ask “find me something round” or “find me something you can throw”. For this level you want to ask questions about the way something looks – big/ little, colours, shape etc or by what you do with it e.g. eat it, throw it, write with it etc. We are still keeping it simple. Now we can start to ask harder questions about what the item looks like, what it’s made of or what it feels like. So if you are asking for the ball you could ask “find me something that’s a sphere, made of plastic and we can throw it”. If you wanted to describe a pencil you could say “find me something that’s made of wood, pointy and we write with it”. You can make this harder again, but only giving one clue at a time and seeing how they do. If your child can do level 3 easily, even when you are giving tricky clues, you can get them to become the teacher. Get them to describe an item for you to guess/ find. This is harder and suddenly needs them to think of ideas and put them into sentences, but is often good fun to try. Just be aware that at first you may need to give them choices or ideas to create their description. Helen mentioned last week that we would have some exciting news coming soon – well here it is! We have just set up a new Facebook group called Speech Blog UK Community. The idea behind this group is to create a place for all of us to share ideas and resources – things that work! 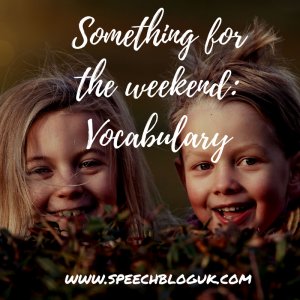 So if you have found a great new game or want to let us know how you got on with this activity, why not come and join the Speech Blog UK Community!